The Supreme Court recently heard arguments on whether state legislatures can purposefully divide up legislative districts so that they benefit one political party or disadvantage others. This practice — called “partisan gerrymandering” — is all too common across our country and can block communities from fairly electing leaders who represent their values and the issues important to them. SO WHAT IS GERRYMANDERING ANYWAY? Every decade after the national census, states draw new electoral districts, which are areas with equal populations that determine who gets to vote for each seat in the state legislature and in Congress. Ideally, districts should allow the voters who live in them to elect a range of legislators who represent the diverse political views of people across the state. Redrawing political lines is a powerful tool that can determine who wins an election, controls the legislature, and ultimately which laws on issues ranging from the minimum wage to climate change to criminal justice reform pass. “Gerrymandering” occurs when state legislatures purposefully draw district boundaries so that they give an advantage to a particular group or party — or put an opposing party or group at a disadvantage. This is primarily accomplished using two different methods: cracking and packing. Cracking is the spreading of similar voters — voters of the same party, race, economic background, etc. — across multiple districts to weaken their voting power in each one. This denies the particular group fair representation in multiple districts. Packing is the concentration of similar voters together in one district to reduce their voting power in other districts. This gives the group representation in a single district while denying them representation across other districts. Political monopolies: Not only is gerrymandering used to protect politicians already in power by making their districts less competitive, but once redistricting happens, it can take up to 10 years before lines can be drawn again. This leads to monopolies of power. Underrepresentation: Poor communities and communities of color are most frequently the targets of cracking and packing, and as a result, their political power is diluted. Heavy Partisan Manipulation: Gerrymandering has much to do with why politics are so partisan today. When districts are gerrymandered to be less competitive between multiple view-points, representatives do not have to compromise on hard line stances in order to win seats. This partisanship goes on to effect everything, from funding, to school districts, to you name it. Change and progress comes from a healthy push-and-pull that isn’t present in gerrymandered districts. 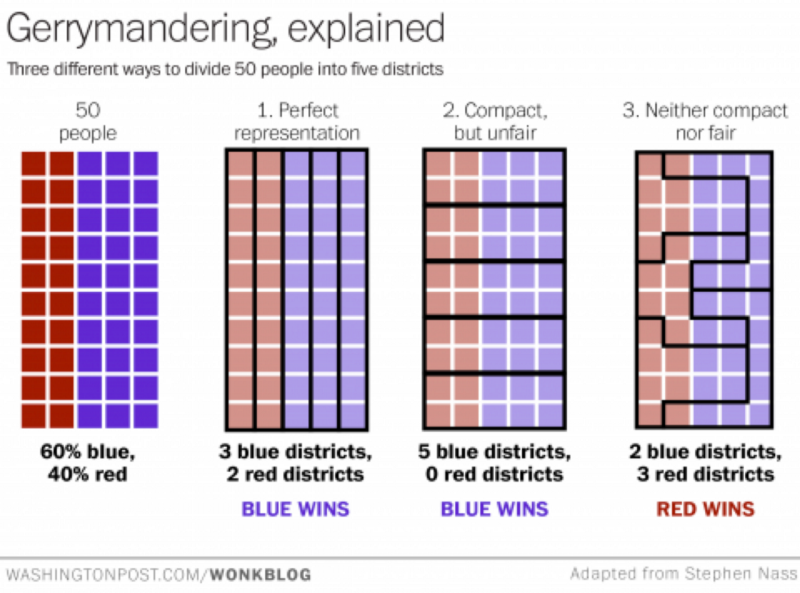 Additionally, not all gerrymandering is the same. There are two key types of gerrymandering that the Supreme Court has considered the constitutionality of: partisan and racial. Partisan gerrymandering, which the Supreme Court is considering in Gill v. Whitford, is used to discriminate against a political party. This prevents opposition parties from gaining enough voters to represent a viable alternative point of view, and leads to the formation of political monopolies. Partisan gerrymandering isn’t new — in fact it’s been around for a very long time — but that doesn’t make it right, or constitutional. In most states, the party in power can draw the lines to serve their own interests, not those of our communities. Even if a district’s shape does not look as bizarre as the first gerrymander, its population can still be engineered to elect a specific kind of politician. For example: Pennsylvania, Ohio, and Michigan are purple states in terms of party affiliation and all voted for former President Obama in 2008 and 2012, then President Trump in 2016. You would probably expect them to send about 50 percent Democrats and 50 percent Republicans to the U.S. House of Representatives. Instead, 34 of their total 48 House representatives (71 percent) are Republican, largely because of partisan gerrymandering.This type of manipulation of the redistricting process undermines the very spirit of our democracy and fair elections. 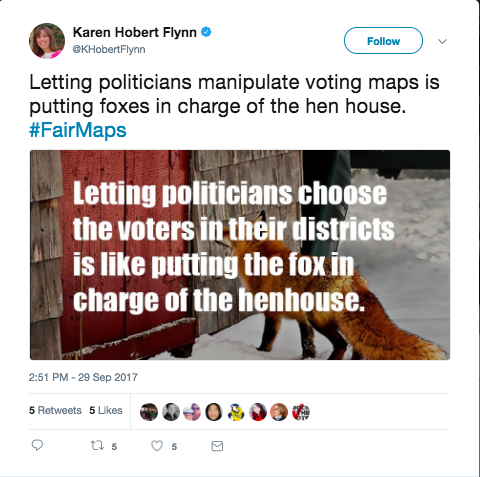 Still, gerrymandering remains a staple of partisan politics at their worst, and shameless legislators continue to use it despite the harm it does to fair representation for our communities. Racial gerrymandering is the intentional, not accidental, segregation of voters based on race. States have traditionally used “cracking” to weaken the political power of communities of color. They do this by breaking up communities of color into multiple districts, ensuring that there are not enough voters of color in any one district to elect their candidate of choice. As communities of color grow, states have used “packing” to concentrate them into just a few districts, thereby weakening their political power elsewhere. With few opportunities to elect their candidates of choice, the concerns and issues that racial groups and communities of color have lack adequate representation in local, state, and federal government. A key enforcement provision of The Voting Rights Act prohibited states from “cracking” communities of color, and courts have time and time again struck racial gerrymandering down as unconstitutional. But, with the Voting Rights Act’s enforcement provision no longer in place, states are free to draw district lines without first making sure that those districts are not discriminatory. Racial gerrymandering is once again becoming a common tool to disenfranchise and suppress people of color. This is worth repeating — gerrymandering is NEVER an accident. The weakening of racial or political groups’ voting strength is done on purpose to create a monopoly of power. Advocates are battling in courts across the country to fix this problem and reign in the rampant use of gerrymandering to block vulnerable communities from building power to impact elections. But, even if you aren’t a lawyer, there are things you can do. Sign our petition: Tell the Supreme Court that partisan gerrymandering is an unconstitutional power grab that cannot continue in our democracy. Keep using your Voice: Attend town halls, participate in local politics, and most importantly, vote in local elections for candidates that not only represent diversity and justice, but actually champion it. You can also use your voice by contacting your representative to share your feelings about redistricting. Stay Informed: Stay up-to-date on national political issues, like the court case mentioned above. Sign up for our newsletter to find out when it’s time to fight back against attacks on our right to vote. Participate Actively: The demographic information the Census Bureau collects every ten years is a key part of redistricting and can be used to fight against gerrymandering. Volunteering for the census is an easy to make sure there is an accurate count of traditionally underrepresented groups, and in turn, fair representation for those communities. And as always, keep speaking truth to power.